Our ascent of Kala Pattar overlooking Everest and the Khumbu began at Gorak Shep, the site of the original base camp. 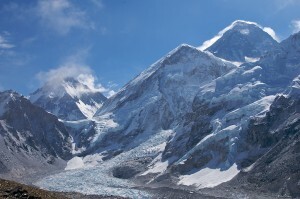 Although we attained the summit in deep mist, this glorious view of Everest, the upper Khumbu and the ice fall just above the current base camp, appeared on our descent. Interestingly, Everest is the highest mountain above sea level, but there are 4 peaks that are further from the centre of the Earth (because of the equatorial bulge) including Kilimanjaro in Tanzania and Cotopaxi in Ecuador on who’s slopes I stood in 2007.